Many sacrifices are made by our veterans during their time of service. Veterans of the U.S. military went through intense physical and emotional training, left their lives and families behind for years at a time, and may have been deployed to fight for our country and its allies. To honor the service and sacrifices of our veterans, Homes for Heroes and our nationwide network of specialists are committed to assisting military veterans buy, sell or refinance a home or mortgage and save veterans money in the process. It’s how we say thank you to our veterans, and here’s how it works. Homes for Heroes guarantees the most hero savings among all national programs. There’s no red tape, making the process easy. There are no hidden fees. What you see is what you get because full transparency is important to us and our veterans. And, there’s no catch. If you served in the U.S. army, navy, air force, marine corps, or coast guard you qualify for the Hero Rewards savings we provide. On average, veterans can save $1,700 by working with our local real estate specialist, $500 by working with our mortgage specialist, $150 by working with our local title specialist, and $50 by working with our local home inspector, for a total average savings of $2,400. The best part is Homes for Heroes mails you a check in the amount of 0.7 percent of the home purchase price after closing on your new home. This allows you to purchase new items or make some immediate upgrades to your new home. To get started, sign up with Homes for Heroes and tell us where you want to live and how to contact you. We will match you with our local real estate specialist and they will contact you within 24 hours to answer your questions and begin the process. They will work with you toward maximizing your savings and finding the home you want. We’ll also connect you with our local home mortgage specialist who will help you secure the best home loan possible. Our mortgage specialists are experts at handling VA loans and other veterans programs. The savings we provide is given in addition to your VA loan benefits. Plus, when the time comes during the home hunting process, you can choose to work with our title and home inspector specialists who will save you more money. Expenses don’t end just because you’ve closed on your new house. You may need things like moving services, home improvement supplies or new furniture. 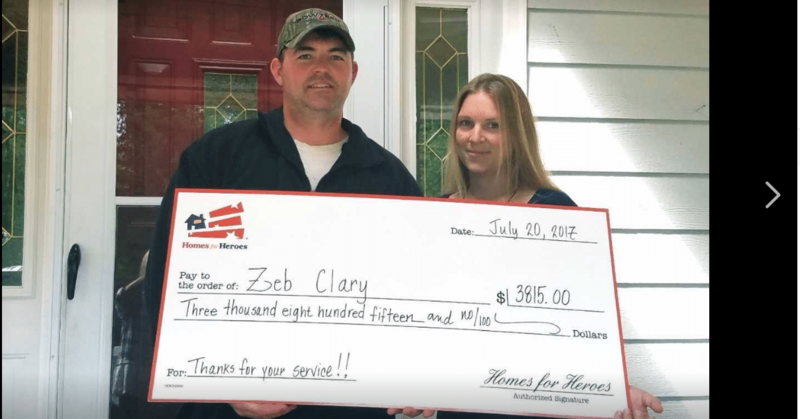 The Hero Rewards savings you receive after closing on your new home can help you cover some of those costs, but we want to help save veterans money whenever possible. Our local deals provide additional discounts on everyday products and services. You’ll find deals on everything from pest control to financial planning to appliances. Many national chains offer ongoing discounts that save veterans money year-round. In 2009 Homes for Heroes, Inc. created the Homes for Heroes Foundation, which has awarded over $500,000 in grants to local nonprofit charities serving heroes in need of assistance as it pertains to housing or emergency financial assistance. When you buy or sell a home using the services provided by Homes for Heroes, Inc. it allows Homes for Heroes, Inc. to make donations to the Homes for Heroes Foundation that serve heroes in need. It fuels a circle of giving where veterans help veterans. At Homes for Heroes, we value the service you gave this country. Let us show our gratitude by helping you save money in the homebuying process and help a fellow veteran along the way. Are you a military veteran looking to change your current living situation? Sign up today and let us help you find a new home and save money doing it.